In anticipation of spring cleaning here in Texas, I am going to be hosting the biggest, baddest Great Monday Give EVER. I actually need to make room on my son's shelves, so I am offering up a mystery box of 25 books. I'm not yet sure what they'll be, but rest assured, the package will be awesome. The best part is, you'll have three ways to win. One... Comment on this post as usual. Two... Follow me on Twitter and then post about the Giveaway using the hash tag #vintagekidsbooksrule. Three... friend me on Facebook and post a comment saying you want to win on my wall. I'll pick one name from each of these avenues (could be the same person) and then randomly pick a winner from the three. By entering the give all three ways, it ups your chances of winning. The give will run for two weeks, so you have plenty of time. Enter between now and Sunday, February 5 at 11:59 PM. A winner will be announced the following day. I promise the box will be filled with all sorts of vintage goodies! Good luck, gang. Oh this is an exciting giveaway for us book lovers! I hope we win! Count me in! My kids and I love your blog! Oh, my gosh, what a great giveaway! I hope I get to see what you pick! (I promise to pass on any duplicates in as generous a manner as you are). Thanks for the chance! I'm in for the gargantuan surprise! Count me in for the gargantuan surprise. that element makes it all the more exciting. Fantastic! Here's to having our name added to the hopper. Wow! What an amazing giveaway!!! I want to win too - love your blog! The box of mystery books sounds amazing! Thanks for the chance to win. How fun! I love this giveaway! I'm crossing my fingers! Thanks!!!!! oh wow me me me!! am i allowed to enter if i live in the uk? If you are outside of the US, you can still enter to win, but if you win, I would ask that you cover shipping. Fair? This is amazing! Thank you!! I love your contests...but I won one of your Christmas books and never received it. I emailed twice with no response. PICK Me! this would be so awesome! Thanks for giving us a chance. We love books! My almost two year old would love to have a box of books that he could ask me to read to him, and I would love some new favorites to add to the(read this one again?) mix! I've lurked here for a long while, but have to de-lurk for this thing. I'm in. 25 books! That sounds awesome. Awesome times twenty-five! Thanks for keeping the excitement alive. For the love of all that is good--- I need ... I mean I beg... I mean I hope...that I win? I'm outside the US, and very happy to cover shipping. karichuckroryskylar.... I saw you note before and checked my e-mail's spam, and still can't find it. I left you a note on the other post asking to try my other e-mail address burginstreetman(at)gmail(dot)com. I don't know why your e-mails have been lost, but I still have the book and would love to send it off to you! I left a comment on your blog, too. Hopefully we can connect! Oh! Very exciting! Thanks for the fun! What a great giveaway! I would love to win it for my sons!!! Oh, I would love that (and so would my children). I'm sure it will be excellent. Oh wow! Studying to become a teacher and I know my future students would love any book from your shelves. Thanks for the opportunity! You can sign me up!! inspiring... I read it every day! (I don't say that just to win, but it's true) When I don't read it I simple admire our great vintage books! I'm so excited by the prospect of getting a big ol' box of children's books from the most awesome blog out there. Seriously, I read it every day & almost as often pin to Pinterest! What a magnificent haul! Count me in please. Oh yeah! Enter me into this one! I'm already following facebook and twitter, and I will enter those ways too! This is awesome! Count me in! This is a great giveaway! good for you good for us! Amazing!! Please please so I can fill my son's new bookcase! Oh this is awesome! What a lovely giveaway that I really really hope I win!! I will now attempt to tweet about it! WOw! What a great giveaaway!! I recently discovered your blog and have been pouring over it!! Would love a chance to win! I will write about you. I will sing about you. I will video myself and Julia reading and doing a little dance about you! Sweet! Thanks for letting us international fans get in on the fun! I'm in. Those shelves look packed! My boys would be in heaven. I hope we win! So Excited!!! What a mysterious and amazing giveaway...Yay!!! I love your bog! Great giveaway!! What a fantastic give. 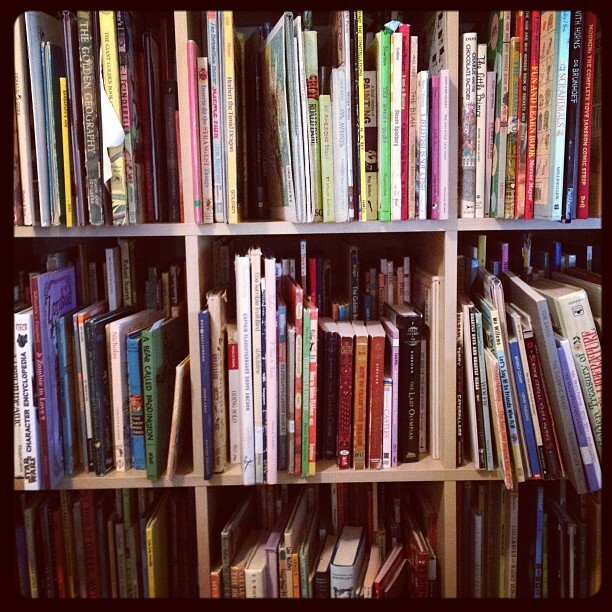 We'd love to add the mystery books to our collection! I would love to win 25 books for my new baby! Would love to see what's in the mystery box! Thanks! Wow! Would love to win! Just found your blog! Love it!!! Just discovered your blog on pinterest! Exciting I teach second grade and have always had a love for old books. Growing up we did not have an abundance of them, it was just not something we spent money on. Be still my heart. Flitter. Flutter. I'm in! Love your giveaways! Wow! what a greta great great giveaway. I hope I win! :) Thank you so much! What a fun giveaway. just by chance I discovered a long-lost title from my childhood (we had to throw our copy away when I was a kid because it was used to help hold down the list on our hamster cage and our hamster eventually chewed through the entire book). Such a pleasure to see it again! I can't imagine the fun of a 25-book giveaway! Your website has been such a great resource for me and my twin daughters! I'm in! What a fun giveaway! I really enjoy your blog. Very excited about finding this giveaway! I was looking up "The Tall Book of Make-Believe" when I stumbled upon your fantastic blog. Wow! 25 awesome vintage books! yes thanks! I LOVE old books! What a great giveaway!! Ohh. I love mysterious surprises. Sign me up! This is my go-to site for books for my kids. I'm fortunate enough to find many of these books at our local library. Thanks for all the effort you put into making these recommendations. Fantastic giveaway! Love the illustration styles and color ways of vintage children's books. Thanks for the chance! we love books bring it on!!!! What a great giveaway! Love your site - it brings a smile to my face every day! What a great giveaway. I have just found your blog and what a find it is. Will happily accept a win. I just found your blog. I drooled over your bookshelves. And I want this box. I'd LOVE me some more vintage children's books.....Thanks. Still drooling over the prospect of a box of vinatge books showing up on my doorstep! This is such a perfect prize! Fingers crossed, I'd divvy up the winnings among my twin grandchildren and my young nephews! I know they'd all be thrilled. PLEASE enter me in this fabulous giveaway! Goodness, the competition is stiff this time! I'm almost on the other side of the world near the Southern tip of Africa, but still...I'm sure it'll be worth the postage! I haven't been here for awhile, but I'm glad I stopped by in time to enter. We'd love some new books! So awesome! thank you for doing this! I am confident that my shorties and I would LOVE all of those 25 mystery books! Sounds, great. I love the Mystery Boxes! Love me some kids' books! Me! I'd be more than glad to cover the shipping cost, sign me up please! I would love to enter the draw. What a great give away! I love your blog! I LOVE Mrs. Ticklefeather. I have a copy of it myself. I found it a few years ago remembering it from when I was a child. Ours was all scribbled and cut-up some. As a librarian, I cannot believe what we did to our books! I teach my students better! What fun it is to look at some of the old and not so old children's books again. What a fun giveaway -- my kids and I love vintage books -- well, ok, we love all books :-) We read a lot! What a great giveaway! Thank you, thank you! I love checking out your postings to see all the lovely pictures of all the great books you showcase. That is a prize in and of itself! Sweet! what a great give. We love reading your posts & finding new books to put on our 'hunt' list. Thanks for giving new life to the oldies but goodies. I'm a follower for ages and I love all those golden oldies. Biggest one yet! Are you cleaning house? Good luck everyone. You Rock! Thanks for the chance to win some awesome vintage books! Oh Wow! I love, love , love vintage children's books! Count me in!